I was looking over my "To Cook Soon" file recently and came across David Rocco's recipe for castagnaccio, a traditional Italian chestnut cake. I compared it to another recipe in my file and this seemed to be the better one. Castagnaccio is incredibly easy to make, has almost no fat or sugar and is gluten free; I was looking forward to recommending it to my celiac-suffering friend. So, using chestnut flour from Kalustyan's, wonderful rosemary from my friend Susan and unbelievably sweet raisins from our California based friends Nami and John, I set out to make the perfect castagnaccio. Which I might have done. It was beautiful, as you can see from the picture above. The problem: castagnaccio is not really a cake at all (no leavening) and has a weird taste. It reminds me of the chestnut filling for seasonal sweets in Japan, but is less sweet and comes in an enormous quantity rather than pretty little bites. While I can't exactly recommend it, if you're a chestnut fanatic, you might give it a try. The recipe is set forth below. This is a very Italian, not-sweet pastry, best eaten with some vin santo. Probably originally for Italian grandmothers in the late afternoon rather than for dessert. 2. In a mixing bowl combine the flour, sugar, salt, and water. Whisk the batter well until the batter is silky smooth in consistency. 3. Add the olive oil to a nonstick pie pan and heat in the oven for 5 minutes. Once the oil and pie pan are hot, add the batter. Smooth out the batter evenly. 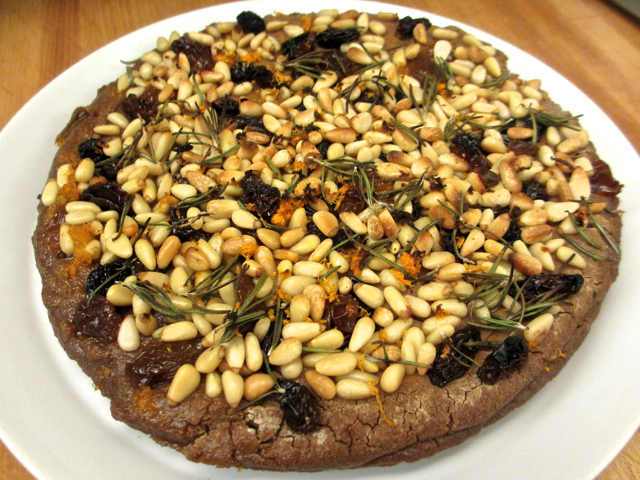 Sprinkle the raisins, pine nuts, rosemary and orange zest on top. 4. Bake the cake for 10 to 15 minutes, or until the top is golden. Spring has finally arrived for real in New York, and the markets are brimming with interesting things, particularly greens at this point. So I set off to the Union Square Market to see what was in season and to develop ideas for using the season's bounty. The things that most inspired me were new garlic, ramps and rhubarb. So I bought bunches and, upon returning home, decided what to do with them. First, I made ramp risotto, using the bulbs as the onion/shallot component and the leaves in lieu of arugula or similar greens. I sliced the delicate cloves of new garlic as thinly as possible and threw them uncooked into the risotto about five minutes before it was done; this was enough to cook them lightly without losing their delicate flavor. The verdict: so-so. It needed lots more ramps and lots more garlic and still I'm not sure it would have been wonderful. 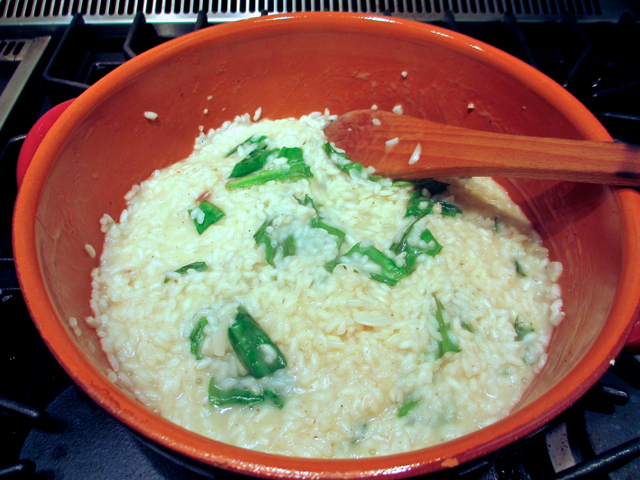 Perhaps the ramps and new garlic are just too subtle for risotto. Second, I made a rhubarb,strawberry and ginger compote, which I served as an accompaniment to home-made ginger ice cream (from David Lebovitz's Perfect Scoop) with crushed ginger snaps for texture and zip. 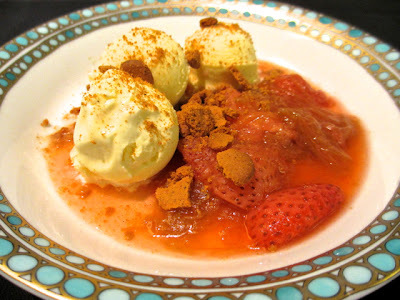 This was a very good dessert and, even though I had to use non-local (but at least USA) strawberries, it was a nice tribute to spring. Even though the risotto was not a great success, it felt good to welcome the local terroir back into our lives. 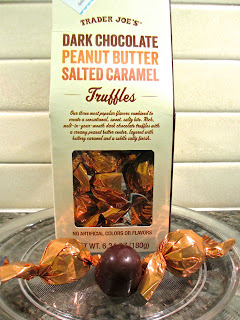 Surely a list of the great edible things in this world would include chocolate, salted caramel and peanut butter. Imagine, therefore, my pleasure in discovering a package of Trader Joe's truffles outside my door last night, left by my friend Piglet. 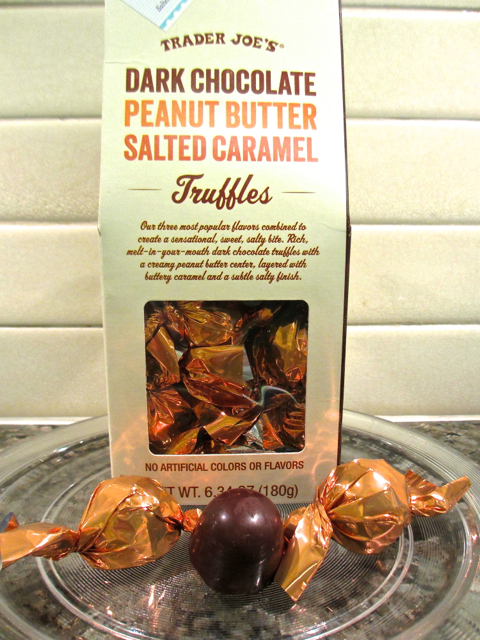 These little bites touch all three bases in a perfectly balanced way, and the quality of the chocolate is high by any standards. And all this without having to go to Paris, where you could only get two of the flavors (no peanut butter there) in any event.